I’ve had the pleasure this year of screening a number of selections from this year’s Tribeca Film Festival, which takes place April 13th-24th. Ask any young person today to name someone who was alive and important in 1970, and it’s a good bet that both Elvis Presley and Richard Nixon would come up very frequently. Those two men held very different positions in society at that point, one a music legend and the other the leader of the country, and by the late 1970s, neither was in a place of power anymore. To imagine them together is a crazy thing, yet one immortal photograph showcases their meeting. 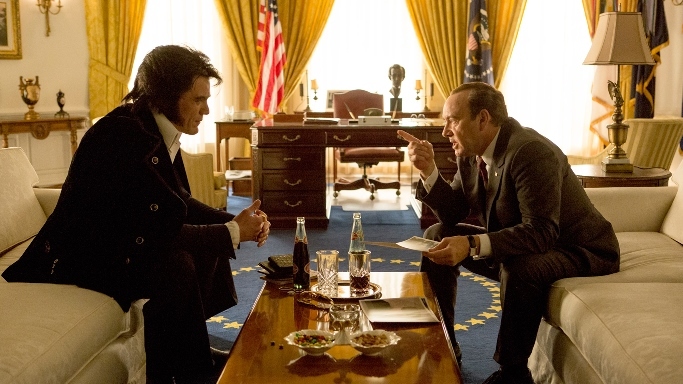 “Elvis and Nixon” dramatizes the whole story of what brought them together and what happened behind closed doors. Elvis (Michael Shannon) needs no introduction, and this film features a number of recognizable traits and phrases coined by the rock and roller. What’s most clear about Elvis is that he does whatever he wants to, bringing his signature style and attitude to everything he does. He won’t play by the rules, and when he gets it in his head that he wants to be appointed a Federal Agent at Large to help the country come back from the direction in which it’s headed regarding drugs and culture, he drives straight up to the White House to deliver his hand-written note in person. Nixon (Kevin Spacey) has no desire to meet with the man, but a series of amusing interactions and conversations lead to the fated sit-down that makes up the centerpiece of this film. It’s a real treat to see Shannon and Spacey tackling these roles. Shannon, who has been working nonstop lately and stars in multiple features at Tribeca this year, usually portrays very serious characters with a dark side. Watching him imitate some of Elvis’ mannerisms and adding his own take is extremely entertaining, and it’s great to see him lighten up. Spacey, who is no stranger to presidential roles, delivers a substantially removed performance from his “House of Cards” character that is still just as sharp and superb. While there are a number of specific jokes and references to be found throughout, anyone with even the most minor knowledge of either man can understand why these performances are great. Though the film contains a subplot involving Elvis’ public relations manager Jerry (Alex Pettyfer) trying to get his life back on track, this is purely a comedy. The supporting cast includes Colin Hanks, Evan Peters, Johnny Knoxville, Tracy Letts, and Tate Donovan, all of whom put on their most serious faces to enhance the entertainment factor as they interact with the absurd Elvis and the flummoxed Nixon, who thought he was something before he met the king. This is a wild adventure that seems too crazy to be true, and this dramatization is a thoroughly involving and memorable take.